Marabou Midstream Services, LP (MMS) was formed in 2004. The company began in 1993 as Marabou Energy, Inc., a natural gas gathering company with midstream assets in Texas, Wisconsin, Oklahoma, and Louisiana. MMS is managed by an skilled and experienced group of midstream energy executives providing producer and midstream services to independent oil and gas producers. MMS’ objective is to provide a midstream solution specifically tailored to you. You do what you do best – find oil and gas – and we take it from there: design, construction and optimization of your midstream infrastructure; marketing, hedging and risk management solutions for your crude oil, natural gas and liquids production; joint interest allocations, working interest and royalty distributions and regulatory reporting. MMS acts as the equivalent of your internal marketing, midstream, design, construction, implementation and operations groups without the associated overhead. We work with you to maximize the value of your assets to get you closer to market. Marabou Superior Pipeline, LLC was founded in 2009 and offers oil and gas producer, gathering, distribution and end-use customers the ability to direct connect with supply and/or delivery, expand existing pipeline infrastructure and/or upgrade and maintain existing production facilities. We design, build, operate and maintain on-site infrastructure dedicated to the specific needs of our customers. Working with you, we develop and implement a plan to design, construct and operate the facilities required to get you closer to market. 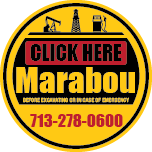 Marabou Energy Management, LLC was founded in 2009 and delivers competitively priced, full requirements, and all inclusive full service natural gas supply to commercial and industrial (C&I) end users via direct upstream pipeline or open access city gates, as well as providing natural gas for fuel conversions, such as propane or RFO to natural gas. We will analyze your options and present you with a package specifically designed to lower your energy costs, maximize your profit and give you the flexibility required in today’s volatile market.